Twiggy and Opal: Take Two :: Redemption! I was slightly disappointed when I first made this design. I had accidentally forgotten to add one critical piece and once I discovered that fatal flaw, I flew through piecing the blocks together and didn't take the time for accuracy! I'm sure many of us have been in a situation like that. There was no question I would try it again, this time taking my time and doing it right. By right, I mean I changed the layout considerably from the first attempt! I think that's allowed and in my book highly encouraged! The second version used the same mix of bright colors and Kona Pepper for the lines. I decided I'd try the design using linen this time though. I believe it's Moda cross weave, but please don't hold me to that! With the first version I used an on-point layout, the second version is your basic horizontal layout. It not only made the entire process easier, but also gave me so many more options with the design arrangement. Piecing your blocks in rows is so much easier than on-point when it comes to accuracy! All those lines are certainly easier to line up! Like the previous version, these blocks are 4" finished and 4 1/2" unfinished. Kind of small, but big enough as to not cause stress! 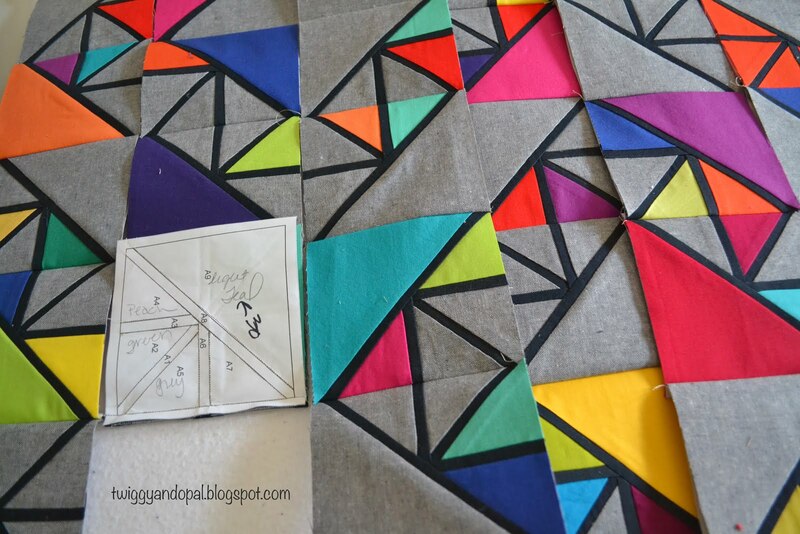 Not only was there design changes, there was most certainly going to be quilting changes. Of course I was going to use a rainbow of thread colors! Except this time I'd keep the quilting simpler and not match the thread and fabric colors. I started with 1/2" diagonal lines using a Aurifil 50wt Light Blue Grey. The lines went from edge to edge and top to bottom. It was a great start and then I sort of hit a wall. I was determined to use all those beautiful bright rainbow colors, but couldn't quite figure out how I wanted to go about it. Instead I took a walk and by the time I got back I knew what needed to be done. I had to remember that I was keeping it simple...stick with the plan. It was better than beating my head against the wall! So it was diagonal lines again in the opposite direction, except I would use the rainbow colors. Perfect and done! 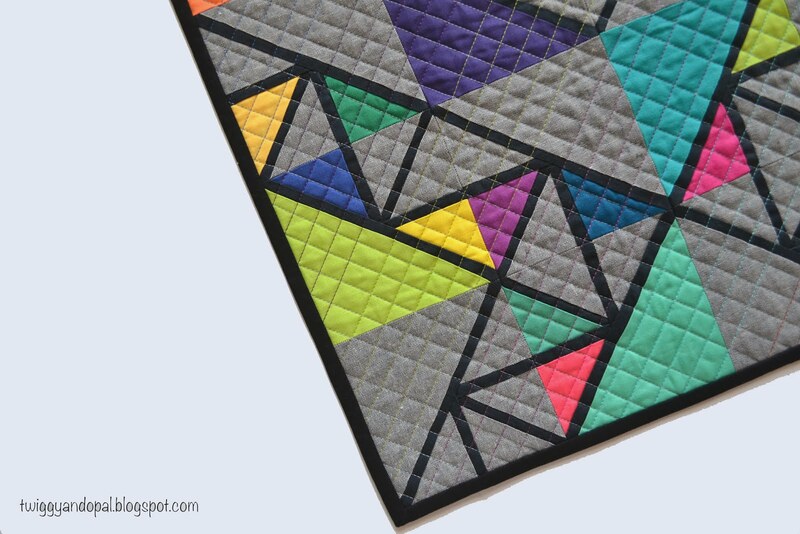 I like the simplicity of the quilting against the seeming complex design. I do believe there was enough going on already! 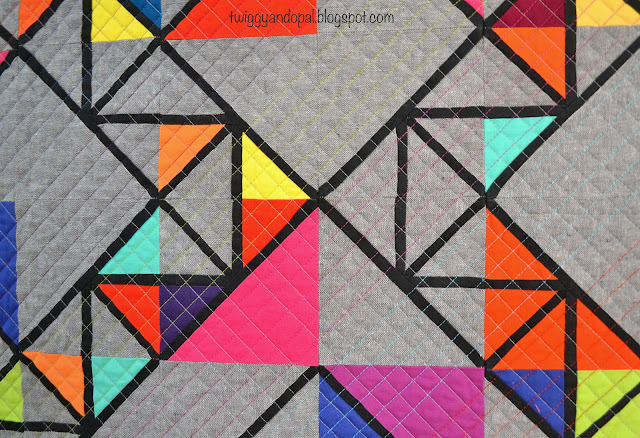 The back shows the design and the 1/2" squares created from the diagonal lines. The close up lets you see the colors a little more clearly. 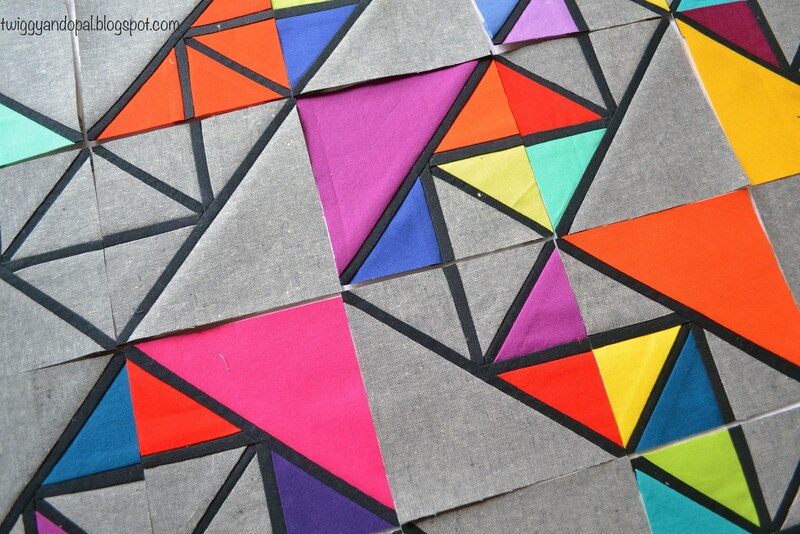 When I started piecing this quilt I wasn't sure how it would turn out, but I was committed to making it work. That meant using what I had on hand. I had no idea by the end of paper piecing the blocks I'd literally have to hunt for one more piece of Kona Pepper! Or that there would be just a few scraps left of the background fabric! This was a 'by the skin of your teeth' ending! That meant that the binding was going to have to be black. If you haven't used Kona Pepper before, it's basically a dark, dark grey. You can really see the difference when the two colors are next to each other. Considering it's just the binding and a skinny binding, I think it's just fine! I've been calling this design 'It's a Gem', which seems pretty lame! Why is it that I can never come up with better names for quilts?! I'm thinking of changing it to 'Eye Candy'...rather lame again! If I wasn't considering writing a pattern for this design, I think I would leave it nameless! 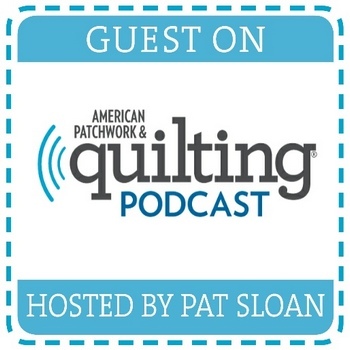 Do you name your quilts? The second version is so much better in just about every way! I like the connections that the new design makes, and to me it feels so much more finished! I really like it, and I can see the improvements from the first version. The quilting is perfect for it. The design seems to have an architectural structure, like girders and trusses; maybe you can play off that concept to come up with a name. Naming quilts is so hard sometimes! I most likely will stick with ‘It’s a Gem’ for the name…it’s good enough! ;) I will keep you in mind when I get a pattern for this! Thank you for offering! These are really wonderful! I think It's a Gem is a fine name. I'm curious tho what your fatal flaw was with #1. I'm thinking I should be able to tell, but I'm not sure! The first version I forgot to add the black diagonal line on my blocks. I wasn’t going to let that happen the second time! Plus, the first has the blocks set diagonally and nothing lined up. That’s what happens when you rush and just want things done! I do like to name my quilts, and I think It's a Gem is a great name for it. I like how you opted to go with diagonal crosshatch quilting and the rainbow of thread colors is a great detail to really draw someone in to look closer. I do, but they are usually a description of the motif or pattern. Not very imaginative on my part. Love the Gem 2 version, the first with it's unfinished lines drives the OCD in me crazy!!! LOL! Why not just call it Redemption or Nameless ... I do like Gem, though, because that is what it is ... I think I like the first version ... but they are both great and colorful ... thus Gem!! I like this version and can't wait to see version 3 - just joking! I probably prefer version 1 but I do like the finished effect of version 2 as well. It's a Gem seems like like a fine name. Great quilt Jayne. There are so many great secondary designs that show themselves as your eye wanders. You are just so darn talented! So fun to see the second Gem. I love them both. 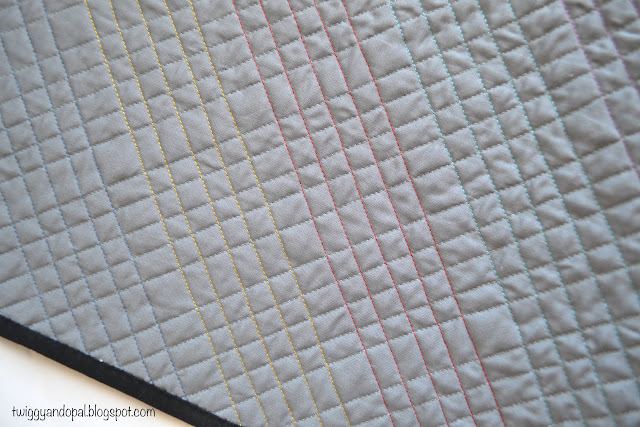 Quilting with multiple thread colors is so much fun, and adds another dimension to the quilt. 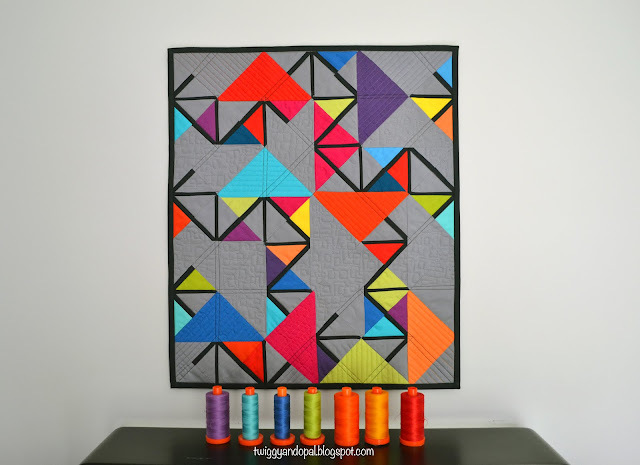 Your simple quilting design with the addition of the colors of thread is spot on! I name many of my quilts, because most of them have some story behind them, and the name reflects the story. 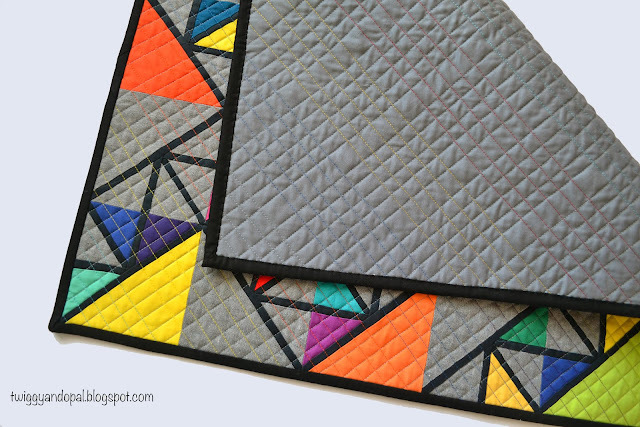 And now you have two beautiful, but different, quilts! They will appeal to different people. The engineers will like the new one, and the free spirits, the first. As for a name, I struggle, too. How about Gems in the Rough or Motherlode if you don't like It's a Gem? Those patterns are worth writing; the quilts are stunning. Your new version is my favorite, I like more of the dark lines in it. It just feels more finished IMHO;) Don't get me wrong I do like them both. I only name the ones I am doing a pattern for. I'm loving the texture your quilting creates on this piece! 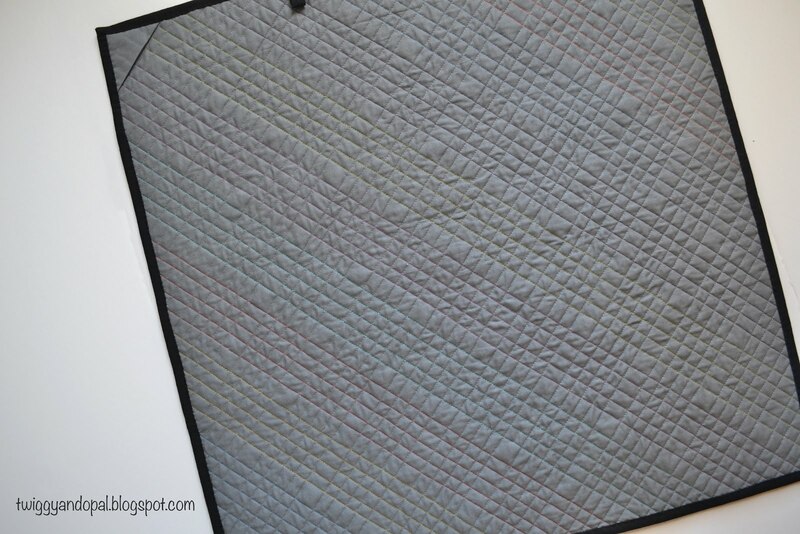 And yes, I do name my quilts, but I usually find the naming difficult and awkward, ha! Its a stunner! I love it! No, I don’t usually name my quilts, unless a name pops out at me. The first version is stunning! I love the way the quilting follows the design on the second one. Beautiful colors! I love everything about this, Jayne! It is neat to see how your idea evolved from the first to the second version. I also liked that I couldn't see the basic block in your finished piece until you showed the picture of the paper design. Then I went back and looked, and "Yes, there it is!" 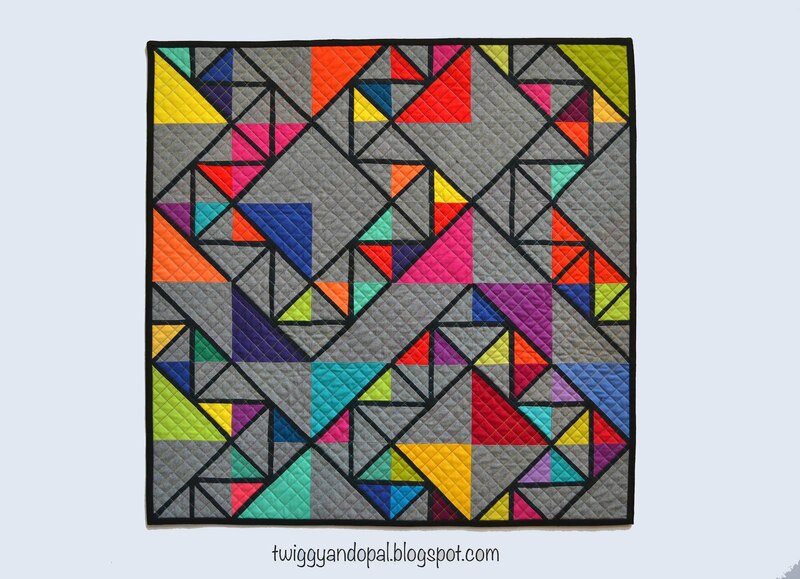 Beautiful quilting, too! I love it! (I really love both versions of the design). The rainbow quilting is just the perfect compliment to the design. Amazing! I love Kona Pepper. I think both names are fine. I'm not very good at naming quilts. 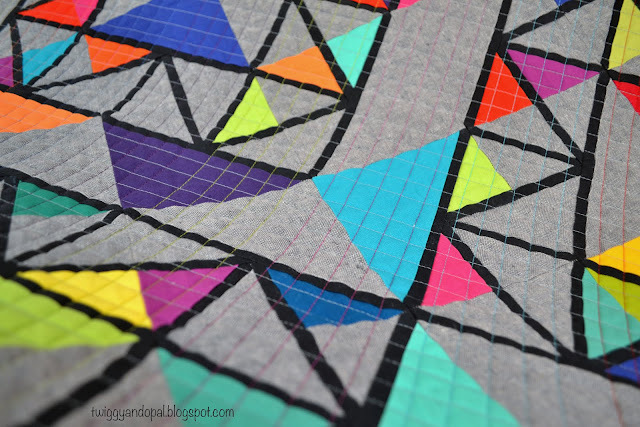 Flying High :: Pattern Release!